That's a pretty good Idea, I started with something like that but the way you show looks better, I will give it a try. I have not yet tested the cars in service yet to see if it works, just a little bit around the dump trestle. Something tells me that having centering springs won't work if you have to couple on a curve, but I will know soon. I had just about given up on my house expansion (new layout room) when I had an idea. I really like what I have except for a few areas. the first area I do not like is the single switch back, I do not like the 5% grade that I have to back up and down. If it were a double switch back I would like it a little better because the train will enter and exit with the locomotive on the head end, I don't like backing in and out of the mining area. And, as much as I like the steep grade coming out of the tunnel I think it could be lowered in the 3% range and still look steep enough without the operating issues it causes the locomotives. second, the tunnel, very unusual on a narrow gauge, especially a mining railroad like mine is supposed to represent, a temporary cheaply built line. I don't like the long hidden run caused by the tunnel and I do not like switching into it at the engine house. third, the company store between the operator and the tracks is a real pain, mostly because in that area the bench work is really high and that store is a major view block. Lastly, if I would like to have all the switching areas closer to the operator, especially if I plan to keep the Sergent couplers, man they look great but they are a total pain if you have sidings that are not in good sight for the operator. I also do not like my work bench, it is way too small and I don't like it sitting under the layout, I always hit my head on the layout above. Overall my existing plan has enough switching to keep me happy and I believe a visitor and myself could have an enjoyable session as well, which made me really think again about the new room. Instead of increasing what I am doing, what would happen if I just fix the areas that I don't like. So, I printed out my current plan and cut out the two areas I really felt like I wanted to keep, the dump trestle and the mining area, which I made as separate sections anyways. I came up with a basic configurations, some areas I just drew in some ideas but they need some more time spent on them. Currently I have five locations to switch out hopper cars but only for of them I have really put to use, so I wanted to make sure I still have four coal hopper spots. I really want to also have a staging track at the end of the line to represent a new extension of the railroad so I have a place to send a work train and supplies. 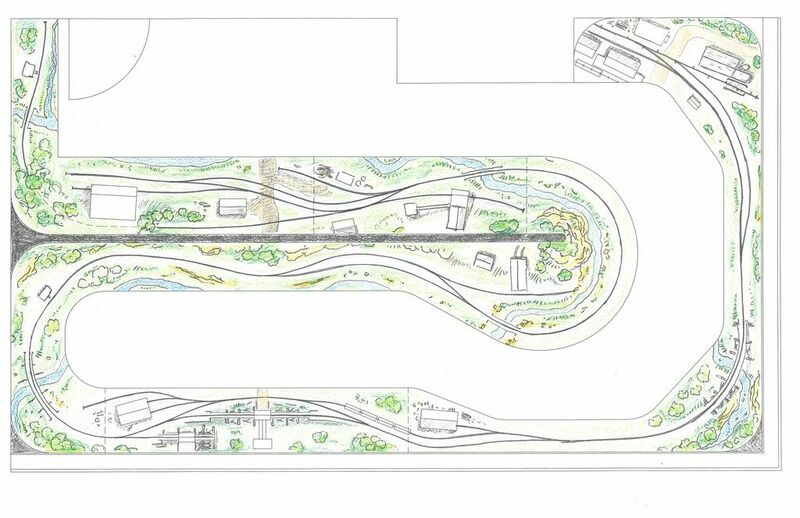 the attached plan shows an extension from the coal dump area to an interchange with the standard gauge. On my current layout I represent this with staging but I feel it would be better to eliminate the staging on that end of the RR and make it an actual switching area. There is not much there but I don't think there needs to be much there and still be a fun addition. Trains will mostly back down to the interchange from the dump trestle area with just a few cars, mostly to pick up supplies for the RR extension and some supplies for the towns and such. To clear the end of the peninsula the layout gets very skinny here, just running on a 5" wide shelf. it might be possible to push this wall out another 18", which will widen the aisle and the 5" wide layout section. from the Dump trestle the layout stays out in the daylight, no tunnel. 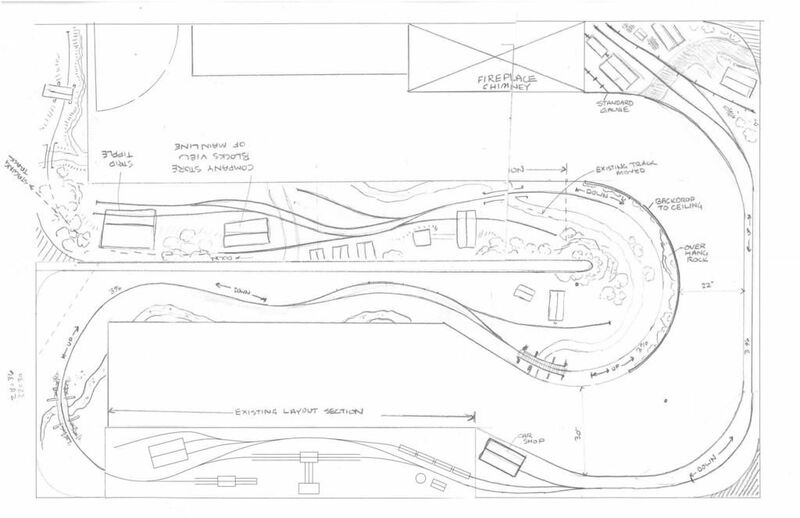 There will have to be a bridge to cross over Slater creek so the RR can get on the "right side" of the mountain, which keeps the running gear of the shays on the viewer side and the boiler pointing up hill. I added a passing siding for two person operations, it gives a place to pass out on the line. I also added a mine here. As the train rounds the end of the peninsula I wanted to try and idea that David Stewart has on his layout. The end of the peninsula has the fascia go all the way to the ceiling to form a back drop, which makes it so you have to look down the canyon and makes it so you can't see down the ends of the layout. Next we enter the mine area. Here I reused the mine area with just some minor track alterations. I really like switching this mining area and I want to keep it, the only difference is the train enters from the other side of town. This section has a break right at the tight curve that forms the run around on the existing layout so I can use that break to eliminate the 90 degree curve that has been really hard to make couple ups on. I also moved the company store, but left the spur, maybe I can find a use for it. After that it gets really gray. I am toying with a way to move the strip tipple to the front the layout. Went back to the beginning - take it that you are now in the other room rather than where the current layout sits. I spent a little more time with the plan and revised the "end of the line" a little more. I simplified it and eliminated the impossibly steep grade. I used the height of the company store to provide a view block, followed by a steep tree coved hill (Which works great in O scale) to hide the new main line as it disappears out of sight. The old main line forms a runaround with the strip tipple at the end of it, up front and easy to switch. I for sure will make the strip tipple operate, which was a plan all along but with it so far out of sight on the current layout I decided not to do it. The strip tipple has some really interesting levers that I want to move when it operates (loads coal). I moved all the company houses to the back and I may make them just flats or turn them to parallel the tracks and only put in two. I like the little houses that Brian Bond has on his layout and my copy his designs here. The old company store spur will be just a spur for anything, maybe unloading mining equipment or stuff for the store, cars, building supplies, ties for treating, pretty much anything. The track that goes around the back of the store will have a switch that will go to staging track in the closet in the next room. The other leg of the switch will go to a coal mine that was built along a feeder creek, again, a small tipple much like one I seen on Brian Bonds layout. As I write this maybe I will honor Brain and call that Bond's creek, and that will be the Bond Creek tipple. I also did some more measuring and it looks like the layout will be able to be pushed out those extra 18", but I will know more when I get some real blueprints drawing up. now I just have to find someone to build this thing. I also did some work on the shay, I mounted the boiler on the frame and did some painting of the cab interior. I took actual measurements of the space I would have to work with and made a new drawing. The good news is that I have 25 more inches in length. The bad news is there is a second floor window that may give me some trouble because it is a little lower than the peak of the new roof. I made some drawings of my house and sent them to a construction guy to see what could be done, my fear is that he will want me to make the room narrower than 14', and if that would have to happen then I will not go through with it because 14' is the minimum I can have to have a center peninsula and have my 36" aisle width, which I won't budge on like I did my HO layout. I really like my current 5' width but that would just be a dream to think I could maintain a width like that. anyways, here is a more honest plan. The lines represent the two sections of the current layout I plan to keep. The only hidden track is the one that disappears behind the company store, which used to be the strip tipple on my current layout, which has been relocated up close to the front of the layout. The hidden track will be my staging track. I was going to make a track in the next room but I decided that I can use the hidden track as staging if I prestage a work train in it before the session starts and have it be the first train run, then the return train will be the last train run, which will keep the track open the entire session. I had a similar train on my HO layout and it worked well. What is nice about having this train prestaged up there is that if I have a guest I can have them start with that train while I have someone else start with one on the other end of the RR and they can meet at the passing track. Having operators start at both ends helps get things moving without people being on top of each other. I am still throwing ideas around for the interchange with the standard gauge. I have a transfer operation and a siding to some industry. I made the track to the industry dual gauge because it would make no sense to have them ship on the narrow gauge. I don't know what this industry will be yet but my goal is that they get some raw materials in on the narrow gauge, maybe some from the standard gauge, and they ship on the standard gauge. I added a coal dump pit for heat and power, plus it makes another spot for a loaded hopper to go. I also made a run around, however I will make is shorter than shown, it only needs to be long enough for a 4-5 car train. I may have another siding for car storage, maybe along the main line and off the run around. here is the plan of the site behind my garage and along side my house. I did not draw the entire garage or house, just the part that would meet the new room. the gas fire place sits in that bump out area and the chimney currently exits out the side of the bump out. My plan is to continue the chimney up to the roof like a real fireplace would have and have the chimney exit out the roof. 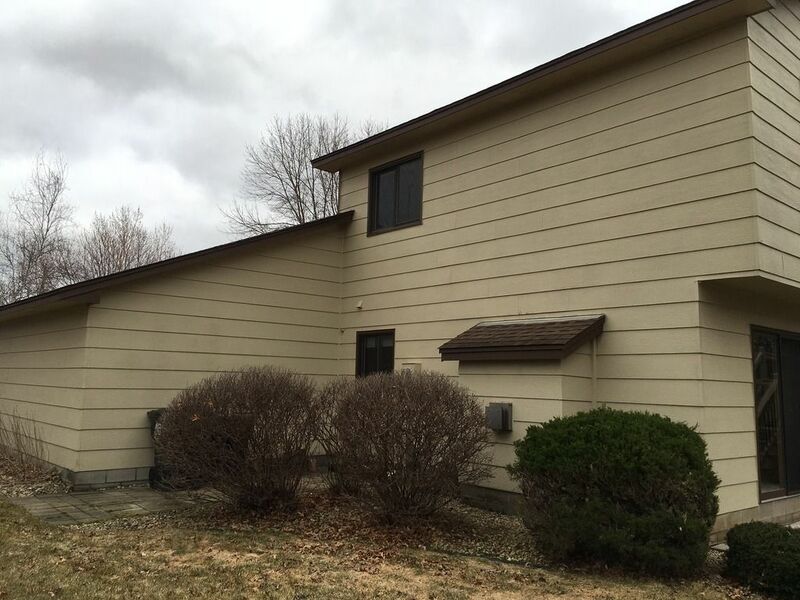 you can see from the photo and the drawing that second floor window that may give me a problem. At first I thought I would just have a different pitch and start the slope from the bottom of the window and then meet the garage at the same height, but that would make a strange transition. Another thought is the convert the window into a dormer. the lower window will be converted to a door. I will have to move the electric meter out to the side of the current garage wall. Fire ce probably says that window is emergency egress so it can't be shortened. Shorter might be OK if you can make the window wider. You could have a trough in the new roof to allow clearance for the window - downside it is a nice source for leaks when snow builds up. Confronted all of this when we had screened porch added. Wound up with flatter pitch on the new porch roof than on the sunroom it joins - same relationship as you garage to new room. 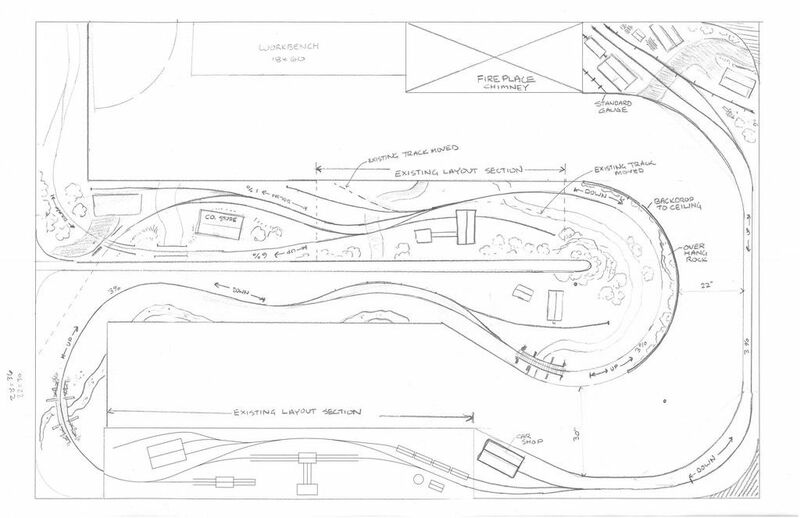 Like the new track plan! Can we see pictures of all sides of the house? 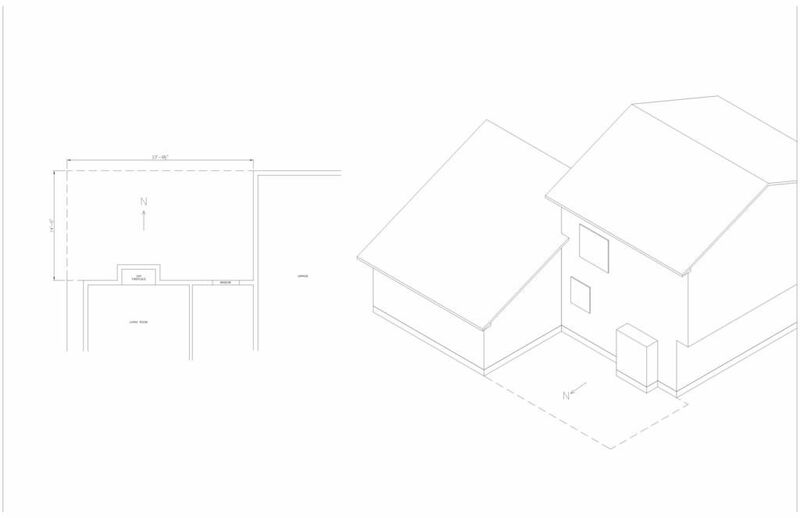 Or a drawing that illustrates all four sides and the purpose of each room of the house? 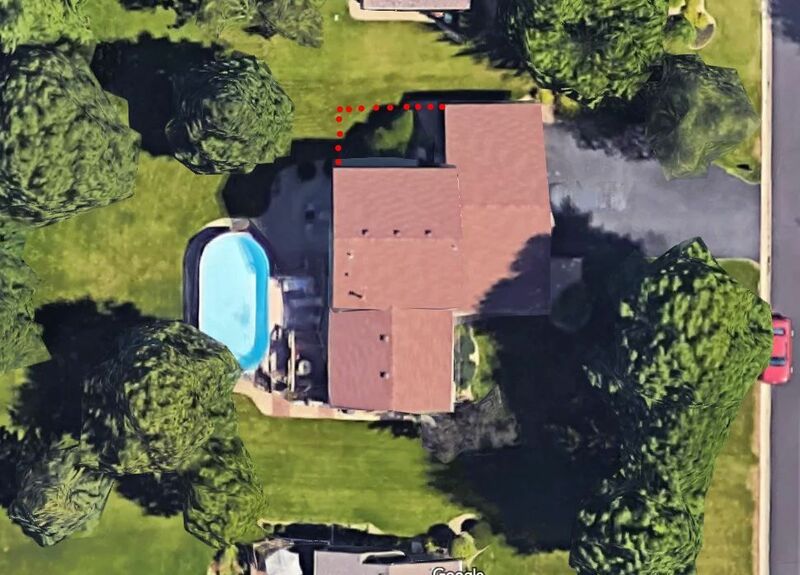 Any particular reason the addition must go on the side of the house shown in the picture above? that is the only place it can go for sure. Looking through your latest posts, I cannot tell if you are planning on building an addition to your house, or if you are extending your layout into the room adjacent to it like you considered doing a while back. The upper left corner behind the door: I would consider a facing spur at the loader so you can deliver empties and pickup loads in one move. The siding on the peninsula: Is this going to be on a steep grade? Will you be able to hold cars on the siding while switching? Also, I think the extension to the standard gauge transfer could give you an opportunity to model a bank of coke ovens. Not sure how to work them into the scene, but it looks like there is enough room. I like your idea Arthur, it looks better than what I was thinking, I would have to check to see if I can drop it 2' without causing a drainage issue outside. Maybe there is a way to still have the out side be up on a 24" foundation but have the floor inside dropped. Mark, this would be a new addition built on the house. The trouble I would have building into the adjacent room where my layout is now is that there are a ton of obstacles in that room to work around, one of which is a big window that my wife does not like me covering up. 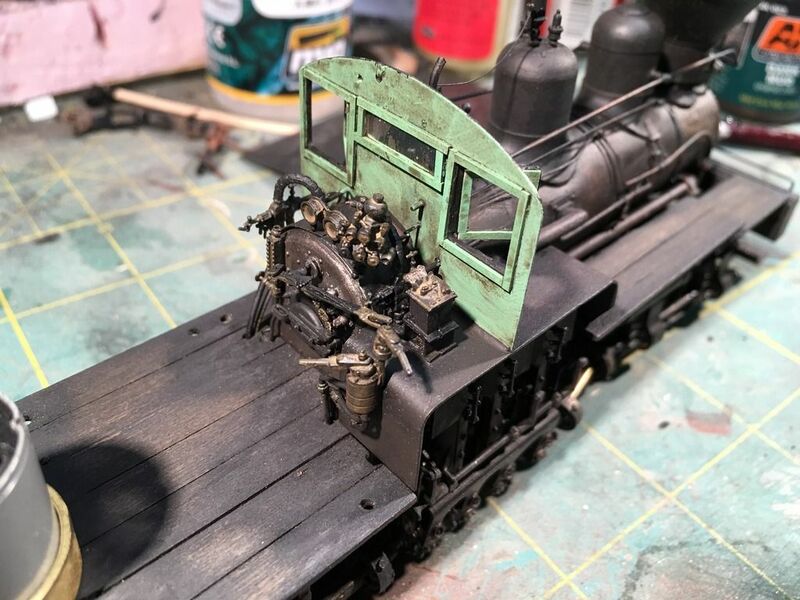 I made the siding in the upper left just a single dead end branch because I learning that it takes a lot of scene depth in O scale to make even a small tipple fit. Also, having to make two trips to work the tipple is not really a bad thing. The operator will have to run light to pick up the loads, return to the run around, then head back with a few empty hoppers which will eat up some operating time. The other area you had concerns would all be level. From the start of the passing siding to the small trestle (including the tipple siding) would all be level. I decided that I would reduce the grades to around 3% so that there is not as much issues with locomotives running down grade and bucking. Adding the coke ovens at the interchange would not really be much of an operation addition because they would have been worked by the standard gauge. They would be interesting to look at but really they would be back at the dump trestle. Is there a demand that the layout room be attached to part of the house and remain accessible inside? Wondering if it would even be just as affordable (and likely more flexible and accommodating to the modelling needs) if a free standing small shed/barn/room was constructed in the yard? I know rules and regulations are likely quite different where I live down under, but the shed I built, with lined and insulated walls, carpeted and power/lighting just where I wanted it, was far cheaper than I would ever be able to do if to constructed a connected new room onto the current house (and I mean at least less than 1/4 the price).